Celcius sprung from 'good old kiwi garage beginnings'. From humble beginnings (circa 2004), like so many before us we started our business in our garage. Based in Wellington - the beating heart of New Zealand Coffee, we started out very small, with a BIG dream. A dream to become a recognised player in the NZ coffee scene and to become 'New Zealand's first sustainable coffee company'. Our dream became a vision for our business and it's still the same to this very day - to produce awesome, consistent coffee and operate our business as sustainably as possible. 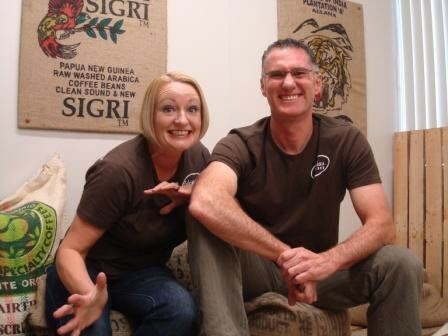 We're are a small, very friendly, caffeine addicted team of folks who are proud to be NZ owned and operated. We're good, honest, real people who love what we do and want to share our great coffee with you. We've worked tirelessly over the past decade to follow our dream and vision and the hard work has paid off. Having won several sustainability awards in recent years, we have well and truly cemented our place as one of the most sustainable and very best little boutique coffee roasters in Aotearoa. So why not give us a try and join the ever increasing family of "Celcius Coffee Converts' throughout New Zealand; who have unearthed the real joy of Celcius Coffee and are Enjoying Today - Sustaining Tomorrow.